I should be more patient! 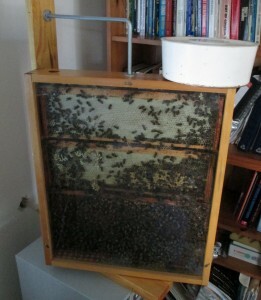 Last week I thought the queen in the observation hive had failed to mate properly and was a drone-layer. She had laid two slabs of drone brood with no sign of worker brood, something I had never seen a newly mated queen do in a full-sized hive before. So I (wrongly) assumed she had not mated properly. Well, of course she knew what she was doing and a healthy slab of worker brood has now been laid (picture on left).And nectar is pouring in too, so I may have to think about exchanging a frame to make sure they have space. 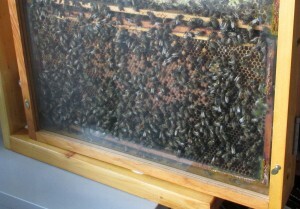 Two super frames almost filled with honey. Note the drone brood in the bottom right of the lower super frame.